A number of recurring subjects mark the films of Alfred Hitchcock and these may be central to the narrative or peripheral elements that are nonetheless distinctive features of the plot. Hitchcock has a bizarre fascination with the family dynamic that he presents. Rarely is the family the traditional happy, nuclear family that one might expect to see, but these families are also not so overtly dysfunctional. During the middle of his career, Hitchcock began to base his families on Freudian theory, something in which he was interested in exploring. One film in which this bizarre dynamic is relatively overt is Strangers on a Train. The relationship between the primary antagonist, Bruno Anthony, and his mother is heavily implied to what Freud would describe as being Oedipal. An Oedipal complex, as described by Freud, can be summarized as thus: When a boy is in development, he begins to have strong romantic feelings for his mother and sees his father as a competitor for his mother’s affections. This is supposed to fade as the child matures, However, those with Oedipal complexes do not grow out of this, causing them to desire their mothers for their whole lives. While audiences at the time would have found this characterization shocking – perhaps perfectly fitting for a villain in their eyes – Hitchcock is well aware of these Freudian ideas and can, presumably, see the parallels to his own life (if one is to believe that Hitchcock is auteur movie-maker). I feel it necessary to make a note here: The following interpretation is based on pure conjecture and is under the assumption that Freudian theory is correct in some way despite being largely discredited. Hitchcock continued to have a strong, almost subservient relationship with his mother until her death and stated repeatedly that he held disdain for his father, two symptoms of continuous Oedipal complex. However, he was not effeminate or gay. Rather, and this only applies when taking Freud’s theories as truth, Hitchcock repressed any feelings of effeminacy. As Robin Wood states, “It [patriarchy] requires ‘real men’ and ‘real women’ […]” The patriarchal structure of the times during Hitchcock’s life could have been a huge factor in his possible repression of any effeminate urges. To combat this, Hitchcock portrays Bruno himself as the embodiment of feminine mama’s-boy. This can be seen as Hitchcock’s acting out, in a sense. Bruno quickly steals this show upon his entrance to the film and remains the most fascinating character. This could be conceived as commentary by Hitchcock on the nature of effeminate men and how truly interesting they are. 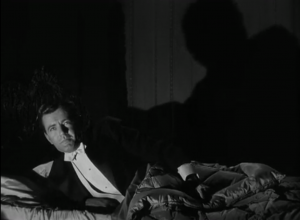 While some may interpret the making of the probably gay man the villain, it only reinforces the idea that Hitchcock, in some way, may be repressing feminine urges, as he instinctively would not want people to associate him with portraying a gay man as a hero, at least in the 1950s. This entry was posted in Hitchcock Themes on October 24, 2014 by rshipe. In the movie Strangers on a Train, one character in particular plays a role in creating many of the Hitchcock trademarks within the film. Bruno Antony’s character is necessary for Hitchcock to utilize Freudian theory and to create one of his classic motifs: the dysfunctional family. Bruno clearly has an Oedipal relationship with his mother. Specific instances when viewed in combination create this evidence. 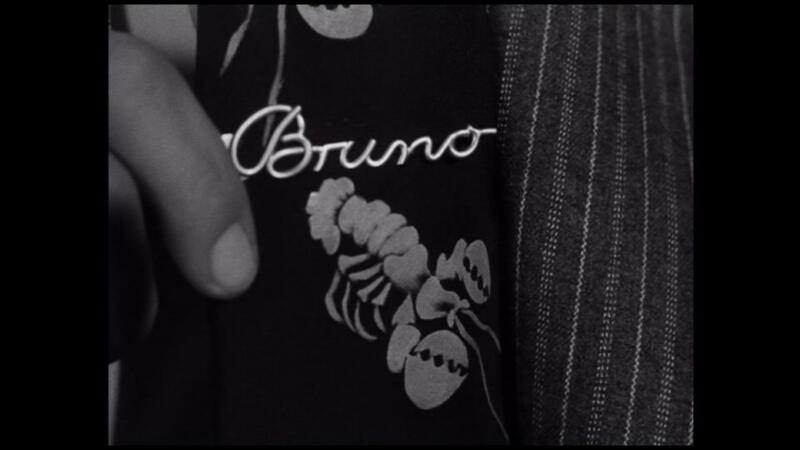 For example, the instance when Bruno wears a tie with his name on it, and states that he only wears it because his mother gave it to him and he wants to make her happy. 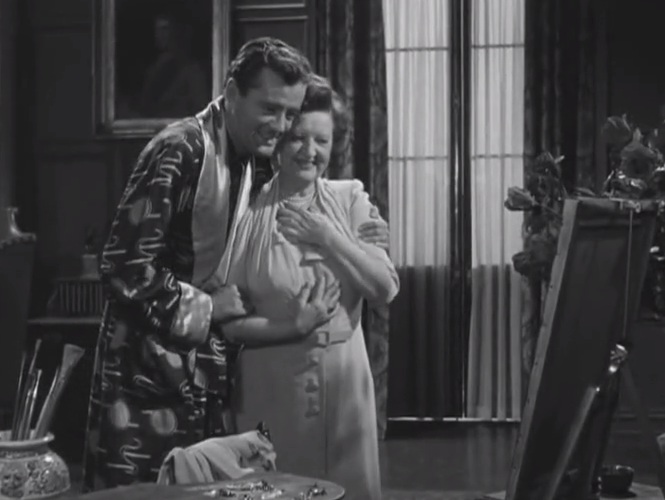 In another scene, Antony holds his mother just a little too close for a normal mother-son-relationship after viewing her painting. This painting, and Bruno’s sadistic laughter coupled with his comment, also illustrate an oedipal complex. 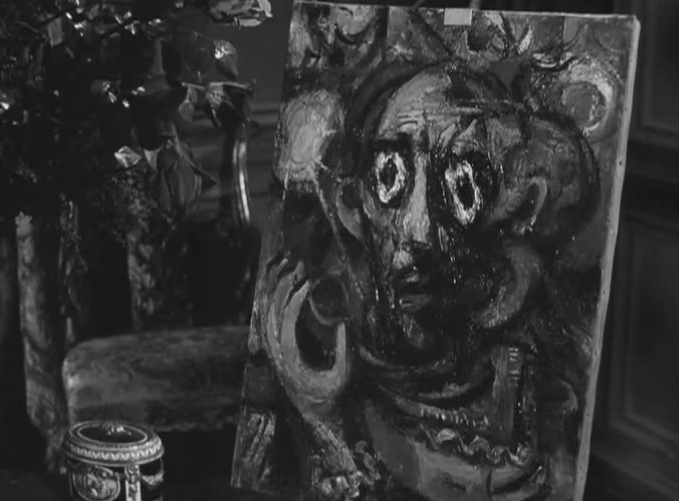 The painting is evidently supposed to look like a human, but looks more like a demon, and Antony comments that it looks like his father. This comment along with Antony’s blatant attempt to have his father murdered show the side of the Oedipal complex which involves competition against the father. These characteristics (mother-loving, father-hating/killing) are part of Freudian theory, and Bruno was a vehicle for Hitchcock to insert Freudian theory into the movie. The idea of being a “mama’s boy” also carries other implication, in stereotypes and in this film. Oftentimes a close relationship between a mother and son is seen as an indication of the son being homosexual. Other aspects of Bruno’s behavior and manner also point out his homosexuality, such as his effeminate way of speaking, his fashionable clothing choices, his physical closeness to Guy on the opening train scene, his talkativeness, and his careful self-grooming. Bruno’s homosexuality adds an interesting layer to the his relationship with Guy, implying possible sexual undertones during their interactions. Another element of Freudian theory suggests that Bruno is Guy’s double- that he represents Guy’s unconscious and conscious desires (i.e. being gay, killing Miriam). Wood, Robin. “Murderous Gays: Hitchcock’s Homophobia.” In Hitchcock’s Films Revisited, 338. New York: Columbia University Press, 1989. This entry was posted in Hitchcock Themes on October 24, 2014 by Emily Dabbs. In Hitchcock’s Strangers on a Train, an interesting familial relationship is shown between Bruno and his mother. 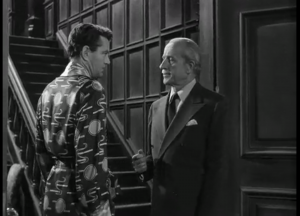 Robin Wood in Hitchcock’s Films Revisited points out that their relationship is an example of an Oedipus complex, in addition to Bruno’s case of repression. According to Freud’s theory of the Oedipus complex, male children at some point in their development begin to experience an unconscious desire for their mothers while identifying with and competing against their fathers. This supposedly translates to a repression of feminine qualities that are considered “unsuitable” for a male while creating typical heterosexual desires. However, according to the theory, some never complete the “oedipal trajectory” and end up stuck with an Oedipus complex throughout their adult lives. Bruno depicts this complex, becoming the epitome of a “mamma’s boy”. It was believed in the time period that the movie was made that a failure to complete the oedipal trajectory could result in homosexuality and femininity, qualities that would have been considered a sufficient explanation for Bruno’s villainous actions. He represents this theory: he is fixed on his mother to an uncomfortable degree while simultaneously hating and desiring to murder his father. He never repressed his feminine qualities, making him act more flamboyantly than the typical-heterosexual character of Guy. He also identifies more with his mother than with his father, furthering their dysfunctional relationship. This entry was posted in Hitchcock Themes on October 24, 2014 by lfremont. In Alfred Hitchcock’s Shadow of a Doubt, he makes an interesting comment on the dynamic of the family. Hitchcock depicts the average family as being more complex than one might think. McLaughlin’s essay “All in the Family” makes a valid point to back up this argument; “The façade of the Newton family home in Shadow of a Doubt is composed of sweetness and sunshine; behind it, however, lies, in the words of Uncle Charlie, ‘a foul sty’ (145).” On the outside the Newton family looks rather normal; there are three kids, a mother and father who both work normal jobs to support the family, and they live in an average-sized typical American home. 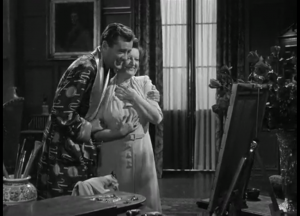 Mrs. Newton’s actions demonstrate that she is trying to prove to the outside world that this is the case, especially when the detectives come into the home. Charlie’s classmates are in awe over Uncle Charlie, and see a perfect uncle-niece relationship. However, once we get to see what is really going on within the family, we see how strange and abnormal the relationship is between these two characters. Charlie and her Uncle’s behavior appears to be very intimate with a lot of touching, and they believe that they have a much deeper connection than just an uncle and niece. 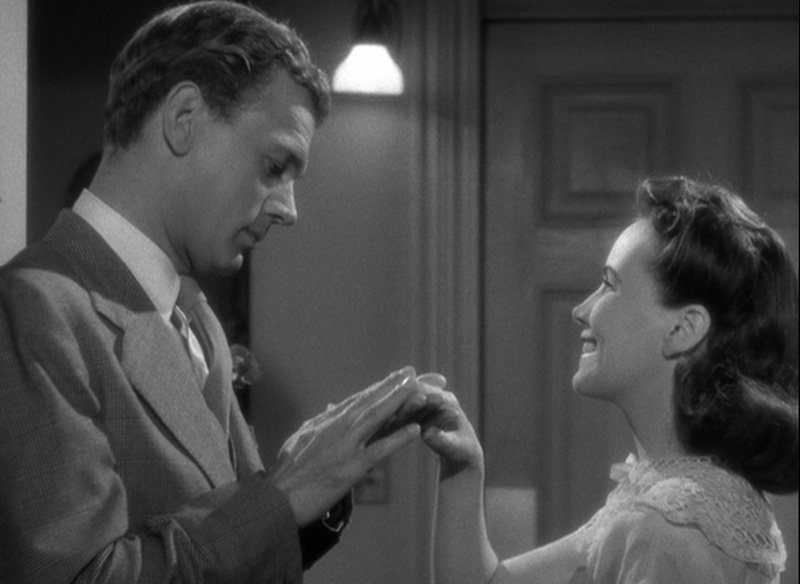 In addition, Uncle Charlie gives Charlie a ring in a manner that looks like he is proposing to her in order to establish control over her. Beneath the perfect looking family, there is one especially strong, unsettling relationship taking place. McLaughlin, James. “All in the Family: Alfred Hitchcock’s Shadow of a Doubt.” In A Hitchcock Reader, 145-155. Second ed. Blackwell Publishing, 2009. This entry was posted in Hitchcock Themes on October 23, 2014 by mmurphy4. In the 1943 Hitchcock film, Shadow of a Doubt, there is an exceedingly disturbing family dynamic concealed within the Newton’s average American lifestyle. The Newton family masquerades as a typical family to neighbors and audiences alike until their beloved Uncle Charlie shows up to unsettle the listlessness of young Charlie’s unsatisfactorily average life. Young Charlie and Uncle Charlie are the most prominent example of a perverse relationship and unsettling family dynamic. 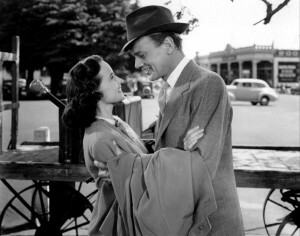 Hitchcock portrays an uncomfortable intimacy and borderline incestuous relationship between an uncle and niece in order to put audiences on edge. This intimacy is felt by the audience through the actions of Uncle Charlie and the way Young Charlie reciprocates them. Uncle Charlie is always quick to embrace and hold his niece, however as the movie progresses the audience seems to find Uncle Charlie’s embrace more sinister in his grip, and Young Charlie’s reactions more uncomfortably hesitant. Critics utilize Uncle Charlie’s presentation of an emerald ring to Young Charlie as Hitchcock’s most noticeable reference to an incestuous familial relationship, deeming it as an “unholy matrimony” between the characters. This entry was posted in Hitchcock Themes on October 23, 2014 by viviandarkbloom. In the film, Shadow of a Doubt, there is a very notable relationship between the protagonist and the antagonist. The protagonist is the young Charlie, a smart teenage girl, and her Uncle Charlie who is the Merry Widow Murder. Even before the Uncle’s true identity was discovered the relationship between Uncle Charlie and young Charlie was borderline incestuous. Uncle Charlie was giving his niece gifts and acting in ways that were all together not fitting for being her uncle. Even how close he stood next to her gave an eerie romantic aura to the scene. 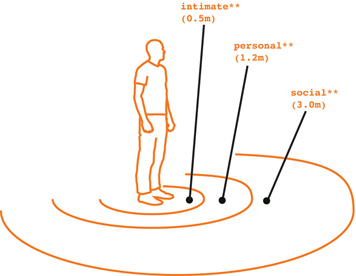 For example in the chart below it is shown what is considered to be intimate, personal and social space and how much space is acceptable between people depending on the situation. It is evident that the space between the two characters is far from social or personal. It would appear that they are very intimate with each other despite the fact they are related by blood. Family dynamics often play a very important part in many of Hitchcock’s great films. In general there is a mother and father who are incredibly overprotective of their daughter. The daughter is always very intelligent and beautiful and tends to fall in love with the protagonist. This time however the family dynamic takes a very different twist. The mother in Shadow of a Doubt seems more lost than anything. She looks up to her younger brother extensively and has no idea anything inappropriate might be occurring between her daughter and her brother. Of course the relationship between Uncle Charlie and Young Charlie takes the family dynamic to an entirely new level. While it is not stated out right that there is a romantic connection between the two I found it was strongly implied and showed that this picturesque family was not perhaps so perfect. However, there is another explanation for Hitchcock’s choice in creating the romantic spark between two family members. Uncle Charlie was a cunning man and he clearly had many mental issues so it would not be a surprise to know he was doing this on purpose. He knew that young Charlie was very bright and perhaps by trying to create a special bond with her he was trying to save himself. This entry was posted in Hitchcock Themes on October 23, 2014 by Jordyn Wade. As a child, Alfred Hitchcock had a strange relationship with his parents. His father had him locked up at a local police station when he would misbehave and his mother would force him to stand at the foot of her bed and reveal to her all of his wrongdoings at the end of each day. His feelings towards his father were not good ones and the relationship with his mother was uncomfortably intimate. These odd exchanges with his parents may have been the inspiration for the unusual family dynamic in many of his movies including Strangers on a Train. One of the main characters in Strangers on a Train is named Bruno. We see early in the film that he, like Hitchcock, has a very close relationship with his mother. His mother is also well aware of his hatred of her husband. Later in the film, when he meets the other main character, he asks Guy to kill his father for him. These feelings might not have been so far from what the director wished for his own father. In Hitchcock’s Films Revisited, Robin Wood writes about a Freudian theory called the Oedipal Complex. Wood suggests that Hitchcock uses a theme called repression in this films because of his homophobia. Freud said that in one stage of psychosexual development, a boy will develop a desire for his mother and a competitive and jealous feeling for his father. One could argue that Bruno never passed this stage in his development which explains the intimate relationship he shares with his mother and his desire for his fathers demise. This entry was posted in Hitchcock Themes on October 23, 2014 by cevans3. In the beginning of the film, at the train station, it is prominent that Uncle Charlie and little Charlie have an interesting relationship. The cutting between Charlie and her uncle walking towards each other reveal their emotions. While lying in bed in the opening scene, Young Charlie also suggests her “desire to cure her family” and do something for her mother. After Young Charlie realizes that her Uncle is the Merry Widow Murderer, her outlook towards Uncle Charlie changes and she becomes scared of him. However, in the beginning of the film, Young Charlie believes that the arrival of her uncle will save the family. When she becomes aware of the murders, her motivations change as she tries to get him to leave Santa Rosa. This entry was posted in Hitchcock Themes on October 23, 2014 by Virginia Malloy. Within Hitchcock’s Shadow of a Doubt, it is evident that there is a disconcerting relationship between Uncle Charlie and Charlie. The sexual tension between the two is an unlikely feature in any family dynamic. In discussing the interactions between those within the immediate family, James McLaughlin observes how Charlie has an “unmistakable, barely conscious, hostility directed at a father”; another unlikely feature of a typical family (148). This assertion is supported with Charlie being portrayed as critical daughter who often makes snide remarks towards her father, Mr. Newton. This can be described as passive aggressive behavior and is perhaps her way of expressing her resentment towards Mr. Newton. Charlie’s resentment is possibly spurred by her boring and idyllic life for which she blames her father. Consequently, there is an innate desire to experience something out of the norm and dangerous, which does happen with the arrival of Uncle Charlie. It is also interesting to see how just as critical Uncle Charlie can be towards Mr. Newton. This is evident from they way he embarrasses Mr. Newton at his work, disregards his comment about leaving a hat on the bed, sits at the head of the table, and continues to rip up Mr. Newton’s newspaper despite the children’s protests. Hitchcock’s intentions for having Mr. Newton characterized as a pushover is unclear, but it is certain that it is used to further intensify the discomfort and to reveal how seemingly typical families can be in reality, dysfunctional. McLaughlin, James.” All in the Family: Alfred Hitchcock’s Shadow of a Doubt.” In A Hitchcock Reader, 145-155. 2nd ed. Wiley-Blackwell, 2009. This entry was posted in Hitchcock Themes and tagged Charlie, Dynamic, family, Hitchcock, shadow of a doubt on October 22, 2014 by Cynthia.